Epiphone presents the newest member of the Masterbilt Century family, the Masterbilt® De Luxe Classic™ 4-String Acoustic/Electric Bass Guitar, featuring all of the Masterbilt Century’s critically acclaimed features including a Solid Spruce top with traditional longitudinal bracing, Ebony fretboard, and the eSonic™ and Shadow NanoFlex™ HD pickup system for true acoustic tone when plugged in. Body Dimensions Lower Bout: 17"
Fingerboard Inlay Pearloid "Notched Diamond"
Like the Masterbilt Century Archtops, the new Masterbilt® De Luxe Classic™ 4-String Acoustic/Electric Bass combines the best of Epiphone’s vintage designs with modern techniques for a superb and affordable acoustic bass that loses none of its tone when plugged in. The DeLuxe Classic 4-string features a Solid Spruce top with traditional f-holes and is available in a Vintage Natural or Vintage Sunburst Aged Gloss finish. The tone of the top is enhanced by traditional longitudinal bracing for a deep and expressive tone that will sound even better with years of playing time. The body is made from laminated Flame Maple with a 17” lower bout like the Century Archtop DeLuxe guitar. The Hard Maple and Mahogany neck has a 30.5” scale and is glued to the body with a traditional dovetail joint. 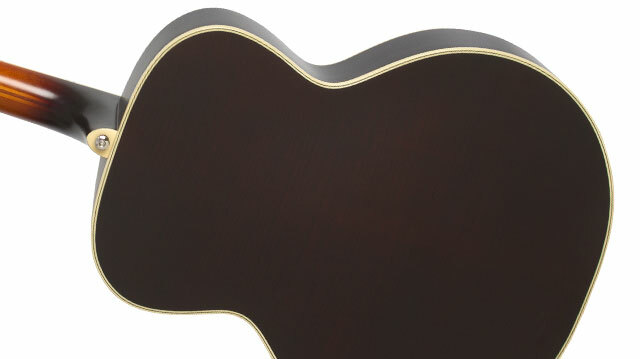 The neck has a comfortable rounded “C” shape profile and a dual action truss rod for fine adjustments. The beautiful Ebony fingerboard has 20 medium frets and Pearloid "Notched Diamond" inlays inspired by Epiphone’s vintage Masterbilts. The headstock has a Historic Epiphone Dovewing profile with the Masterbilt Century’s iconic Pearloid "Banner" logo design. The full tone of the De Luxe Classic 4-string bass sounds beautiful unamplified on a small stage or in the studio. But now the cutting edge eSonic™ HD (High Definition) preamp system and Shadow NanoFlex™ HD Under-saddle pickup make it possible for acoustic bass players to hear their instrument amplified exactly as they hear it unplugged. No bass player has ever heard an acoustic bass more accurately represented through a sound system before. The Shadow NanoFlex HD Under-saddle pickup has easy-to-access controls for Master Volume and Master EQ mounted just inside the lower f-hole. The pre-amp system is powered by a standard 9-volt battery that is easy to access, located near the ¼” output jack. The Masterbilt® De Luxe Classic™ 4-String comes with historic Epiphone Reissue Tuners with Marboloid "Crown" buttons with an 18:1 tuning ratio. The “Crown” tuners are inspired by vintage Masterbilts but have a substantially improved tuning ratio compared to 1930s era Masterbilts. 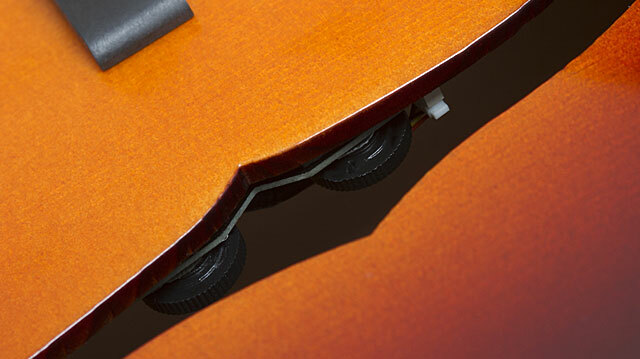 The floating bridge is adjustable and has an Ebonoid compensated saddle and a traditional Epiphone Trapeze tailpiece. 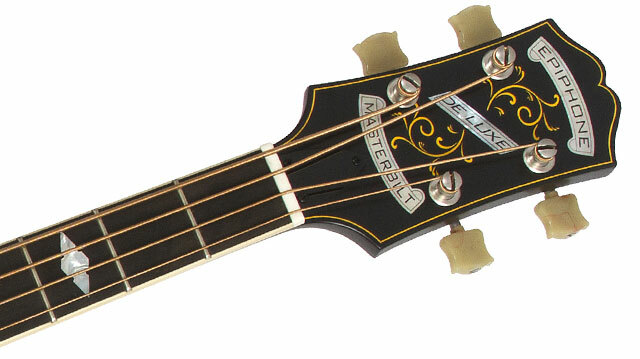 The Masterbilt De Luxe Classic Bass is set up at the factory with D'Addario ETB92M Tape Wound Acoustic Bass Strings. Like all Epiphones, the Masterbilt® De Luxe Classic™ 4-String Acoustic/Electric Bass Guitar comes with a Limited Lifetime Guarantee and Gibson’s world famous 365/24/7 Customer Service. 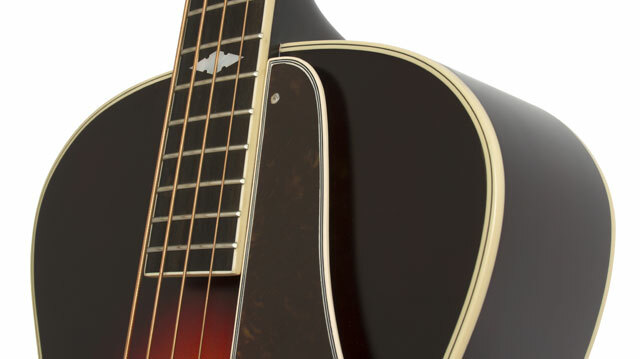 Visit your Authorized Epiphone Dealer or visit Epiphone.com to learn more about the Masterbilt® De Luxe Classic™ 4-String Acoustic/Electric Bass Guitar and all of the Masterbilt Century Collection and re-discover the joys of playing a superb acoustic instrument.